Sometimes, the words tour de force are bandied around performances with gay abandon. But in the case of Aquarius, Kleber Mendonça Filho's film, Sonia Braga deserves the accolade. Braga stars as Dona Clara, a music critic in her 60s, who stands resolute in her apartment building when all else have moved out and the developers come to tear it down. Refusing to move on after a full life in the same building, Dona Clara digs in, but not by drawing battle lines - but by simply living her life. Reflecting on her past and living in her present, Braga's extraordinary class in the role lends the whole piece a sort of innate charm. Broken up into 3 chapters, the story follows its own lyrical beats and pace as it demonstrates a life well loved and friendships well nourished. The enigmatic Sonia Braga is a commanding presence throughout, imbuing the ageing Dona Clara with a sheen of genuine feeling that this is a life well-lived as society has changed around her. And Filho's film also impresses too. From the stunning seaside vistas from the Aquarius apartment in Brazil to the casual reveals about health issues or deaths, this is a film that's masterful and takes its time while spinning its observations out. Building on the life of her aunt early on and how she set the trend, it's easy to see Dona Clara's blossoming into a similar role as she fends off demands from her children to sell up and the developers, insisting that she's better leaving. If there's to be a flaw it's the tail end of the film where the fight with the developers comes to a head with an abruptness that seems crowbarred in. Certainly, the final scene leaves you feeling the story's incomplete and unfinished, which given what you've invested in over the past 2 hours 20 mins is frustrating to say the least. 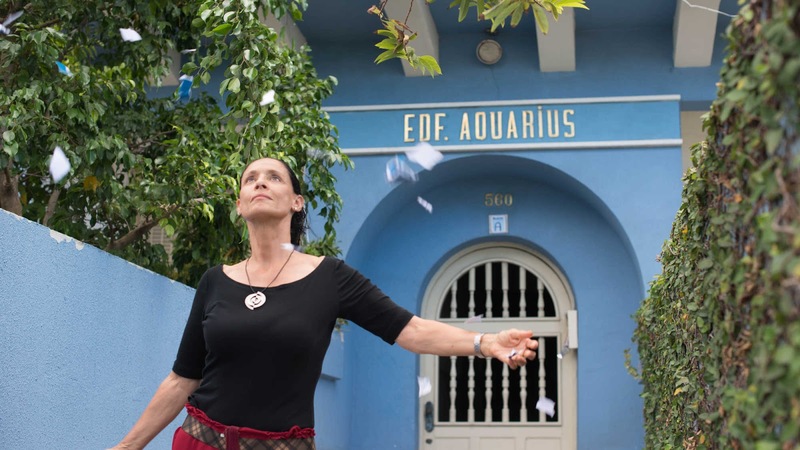 Aquarius is a lesson in class from Braga - she's the reason to see this film, a reminder that great performances are central to film. It's a pinnacle performance.